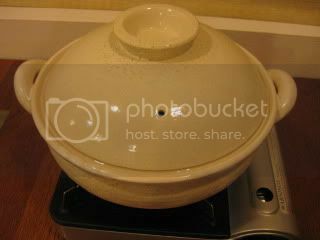 It's becoming a perfect season for soup, stew, and hot pot... My donabe pots are working very happily. This is a very typical sight of my kitchen stove before dinner. Different donabes cook different dishes for one dinner. 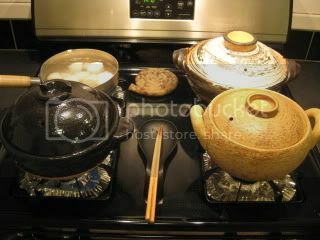 It's also not unusual for all 4 burners are used for 4 different donabes! I made the fantastic Kabocha Miso Potage with the soup & stew donabe, "Miso-shiru Nabe". 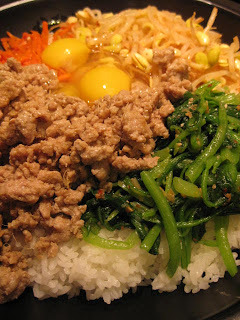 This is another shojin-style (Buddhist style) dish, i.e. it's vegan. This healthy soup tastes so rich and creamy, and it's almost hard to believe there is no dairy or any fat in the soup. 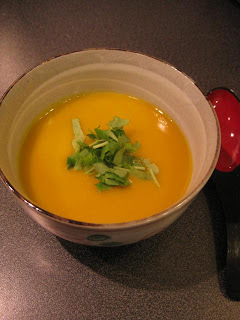 The nuttiness of the kabocha pumpkin becomes pronounced with the dashi and miso. There are only three ingredients in this dish! 1. Slice of most of the skin of the kabocha in a very thin layer. Cut into medium-size cubes. 2. In the soup & stew donabe, "Miso-shiru Nabe", combine the kabocha and dashi stock (less stock will make thicker soup). Simmer with the lid on until the kabocha is very tender. 3. Tarnsfer the kabocha and broth to the blender. Add the miso paste and blend until smooth. 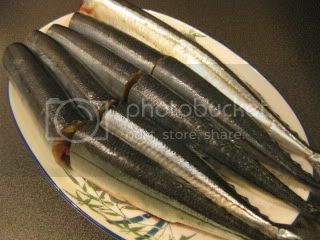 I bought nicely shiny sanma fish and cleaned them. They were already scaled, so I cut the heads off and cleaned the insides. 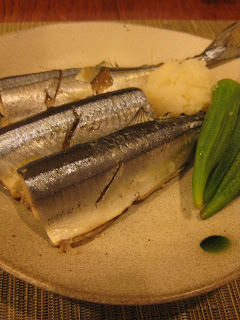 For the rich and flavorful fish like sanma, I like the very simple preparation. I decided to steam them this time. 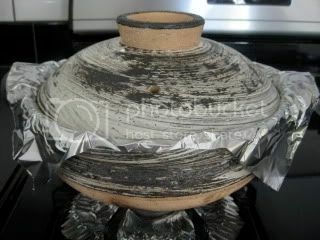 Here's my super-cool Donabe Steamer. 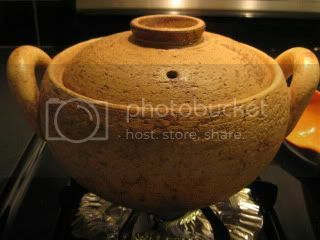 This donabe steamer, made by Nagatani-en from Iga, has been a best-seller donabe in Japan this past years. I am happy to announce that this donabe is (finally) scheduled to be available on toiro's website for people in the U.S. sometime in November! 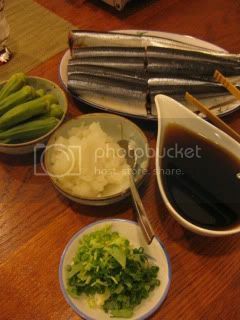 The ingredients are very simple...sanma, okra, grated daikon, homemade ponzu sauce, and sliced scallions. 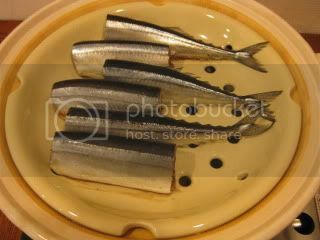 All we needed to do was just put the sanma and okra in the donabe steamer and wait until done. Sanma was so juicy and tasty with all the condiments. 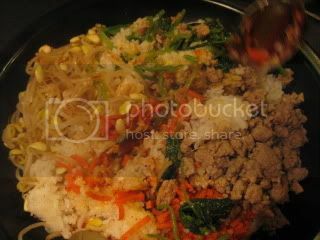 With a bowl of freshly steamed rice, it made a wonderfully happy meal. I made another Okara (soy pulp) dish. Hamburg! 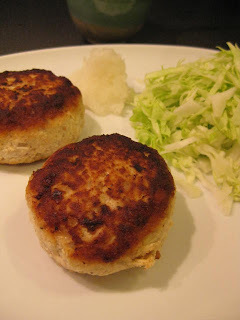 I used both ground Kurobuta pork and okara to make the patties. Okara doesn't only give the delicate soy flavor to the dish, but it also makes the texture so moist and soft. 1. 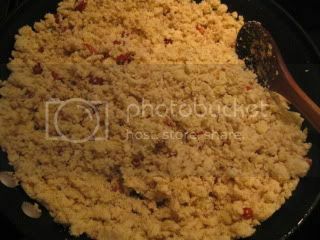 In a large bowl, combine 1 small onion, 1 clove of garlic (both minced), 1/2 lb ground pork, 1/2 to 3/4 lb okara, 2-3 tablespoons of milk, 1 egg, and season with salt and pepper. Knead until smooth. Tightly cover with the plastic and let it sit in the fridge for 30 minutes. 2. 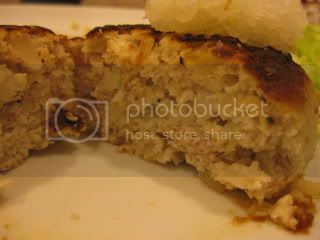 Take the bowl out of the fridge and form into patties. 3. Heat the olive oil in a pan. Cook one side until browned over medium-high heat. Turn the patties over. Pour a good splash of sake. 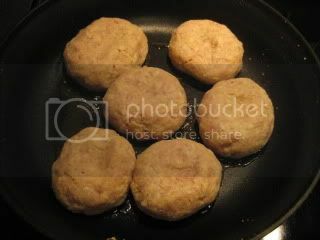 Cover and cook until the patties are cooked through over medium-heat. I served the hamburg with grated daikon, shredded cabbage (best accompaniments! 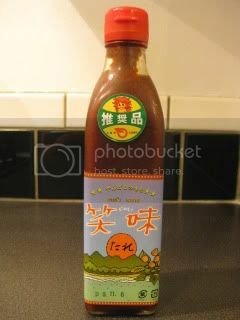 ), and this special "Emi's Sauce", from Okinawa. The sauce is a gift from a friend of mine. I'm so hooked to this sauce. 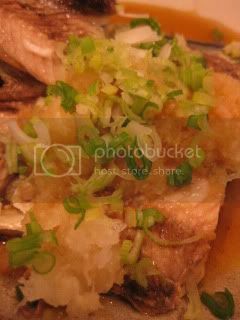 It's got the nice mildly sweet and tangy flavor with the grated apple, onion, ginger, garlic, turmeric, soy sauce, shikwasa (Okinawa's local citrus), etc. etc. The inside was so fluffy and so nice. It was a great dinner. I got a bag of freshly squeezed okara from Meiji Tofu. Okara, or soy pulp is a by-product of soy milk/ tofu. It's a leftover after making the soy milk. Okara is a great health food, as it's high in protein, fiber, and other vitamins. For vegetarian/ vegan people, it's also a great (nutritious) substitute for meat, too. I like okara just because it tastes so good as well as it's versatile as a ingredient! I made a cous-cous style okara and bitter melon salad. Okara and Bitter Melon Salad. 1. Saute the sliced bitter melon(from 1 medium-size bitter melon), king oyster mushroom, carrot, with 2-3 tablespoons of olive oil until the ingredients are cooked through. Add sliced almond and goji berries. Continue to saute for a couple of minutes. Transfer to a bowl. 2. Saute about 2 cups of okara until it's crumbly and less moist. Add 2-3 teaspoons of cumin seeds, 1 tablespoon of garam masala. 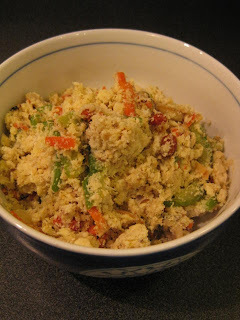 (For non vegetarian version, you can also add 1/2 tablespoon of chicken powder for more flavor.) Continue to saute until fragrant. Transfer to the same bowl. 3. Squeeze out juice from 1/2 lemon over the ingredients. Season with salt and pepper. That's it! With all these different ingredients mixed together, the dish is super-nutrient, and it's really tasty. To serve with the donabe bibimbop, I also made another Korean-style dish, which is the simple chicken and tofu soup with the chicken and soy milk broth. 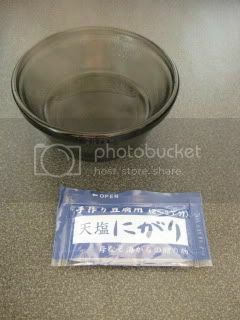 With the soup & stew donabe, "Miso-shiru Nabe", I can make the delicious "healing" soup so easily. The starter is extremely simple. I don't use any stock. It's just the water (about 2 cups) and sake (about 1/3 cup), with scallions (green parts only), crushed garlic and slices of ginger. Once the broth starts simmering, add the 4 pieces of bone-in chicken (I seasoned it with salt and pepper) and simmer with the lid on for 10 minutes. Then, add the russet potato (cut into cubes) and simmer for additional 20 minutes (with the lid). 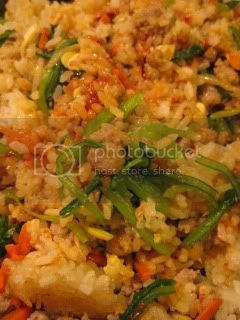 Remove the scallion, garlic, and ginger. Add the tofu and 1 cup of natural soy milk. Season with salt and pepper. 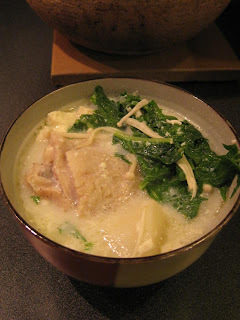 Once it starts simmering again, add the mizuna and enoki mushrooms. Close the lid and turn off the heat. Let it rest for 5 minutes. 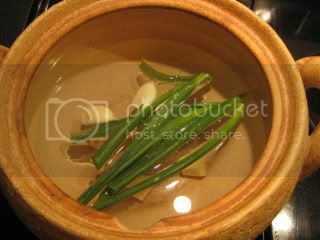 With this donabe's amazing heat penetration by the FIR (Far Infrared Radiation) effect, the soup develops the rich deep flavor (umami) from the bones in the short time. It's so impressive, I must say. 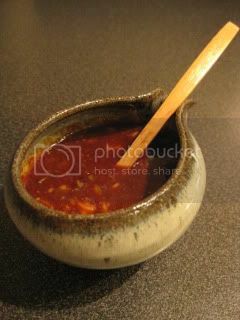 I served the soup with a Korean-style hot sauce. It's 1 tablespoon of each soy sauce and vinegar, some grated white sesame seeds, 2 teaspoons of red chili powder, and 1/2 tablespoons of karashi mustard. The sauce added a nice accent to the soup. 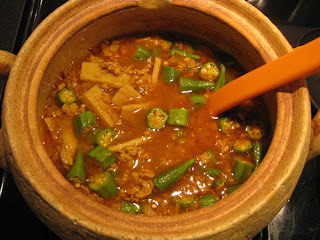 Making Bibimbop with Tagine-style Donabe, "Fukkura-san"
Bibimbop is one of my favorite Korean dishes to make at home. 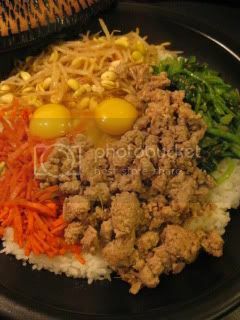 I normally make individual size bibimbop by mixing the freshly steamed rice and vegetables (recipe is found here), and it's always so good. 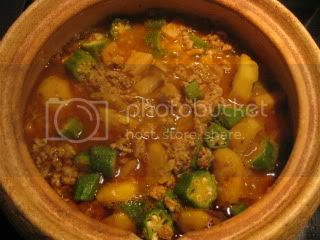 This time, I used the tagine-style donabe, "Fukkura-san", to make the dynamic version, which also makes the "crusty" rice on the bottom just like the authentic stone-bowl bibimbop! Also, I added pork to the dish this time. Here's the recipe for the pork. In a pan, saute the pork with the sesame oil. Once the meat is cooked through, add the garlic and ginger and continue to saute for 1 minute. Add the soy sauce, sake, and sugar. Saute for another couple of minutes. Toss with some sesame seeds and hot chili powder. 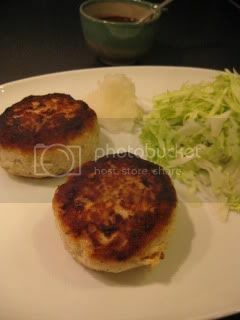 I first heated the skillet of "Fukkura-san" and drizzled about 2 tablespoons of sesame oil. Once the rice is cooked with the double-lid donabe rice cooker, "Kamado-san" (I made 2 rice-cups amount), I transfered the rice to the skillet and let it sizzle over medium-high heat for a couple of minutes (without the lid). 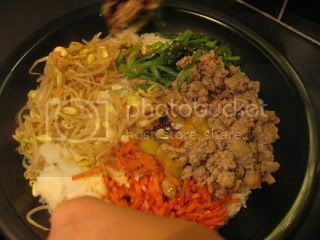 Decorate the rice with the toppings, close the lid, and let it continue to sizzle for another couple of minutes. Open the lid, drop the eggs, and quickly toss with 2-3 tablespoons of kochujang (Korean hot bean pase) by using the large spoons. The eggs will cook with the carry-over heat of the skillet. 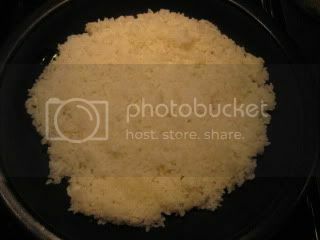 Look how the nice crust is made on the bottom of the rice! The rice is fully mixed. It was absolutely delicious. I made curry again tonight. Jason loves my curry so much. When it's made with the soup and stew donabe, "Miso-shiru Nabe", my curry tastes especially good! The thick clay body builds up the heat and cooks the ingredients evenly with the FIR (Far Infrared Radiation). Even almost 10 minutes after turning off the heat, when I open the lid of the donabe, the curry is still simmering in it! 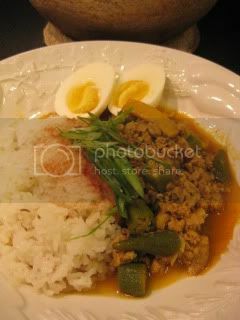 Today, I made the Keema-style curry with the ground jidori chicken and okra. It's basically the same recipe as my Pork and Okra curry, except that I used chicken instead of pork. 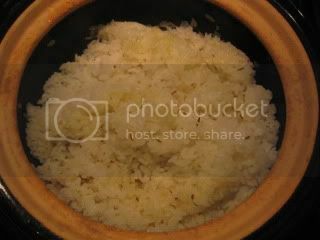 I made the cumin rice with the donabe rice cooker, "Kamado-san" again. With the addition of the olive oil, (this time, I used 1 tablespoon of olive oil for 2 rice-cups of rice. 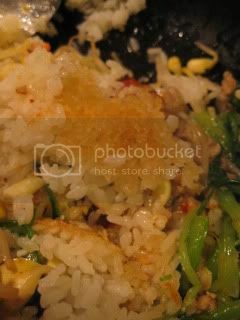 ), the bottom of the rice made a nice crusty texture. Next day, I made another curry with Kurobuta pork and fresh chestnuts. The seasonal chestnuts were so great in the curry. Here is another post about tofu. 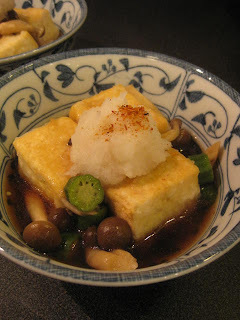 Agedashi Tofu (deep-fried tofu in a broth) is a very rustic Japanese dish and is also a popular item in izakaya's menu. 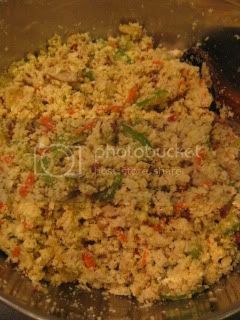 The dish is wonderfully savory and can make as an appetizer or a light main course. 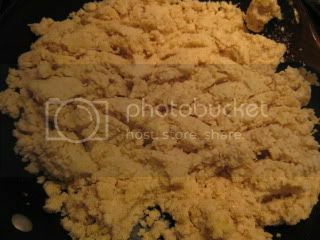 Tofu pieces were lightly dusted with the flour before frying. When the color is light golden, it's ready. 1. In a shallow plate, place the tofu. 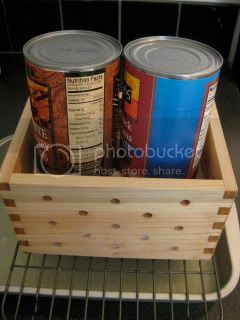 Top it with a small flat board such as a plate or cutting board. Put extra weight if necessary. Let it sit for about 15 minutes to lightly drain the excess water from the tofu. 2. Cut the tofu into 6 pieces. Pat dry each piece with a paper towel. Dust all the sides with the flour. 3. 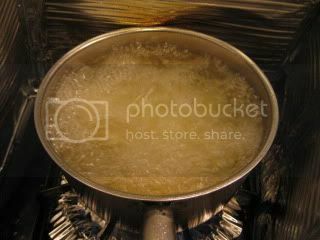 In a medium-size pot, heat the vegetable oil to 350F degrees. 4. Heat the dashi broth in a milk pan. Add the sake, mirin, and soy sauce. 5. 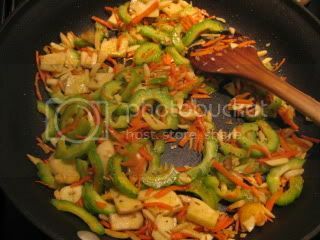 Add the shimeji mushroom and okra and simmer for 2-3 minutes. Stir in the grated ginger. 6. Combine the kuzuko and the equal amount of water in a small cup. Stir in the mixture to the broth. 7. 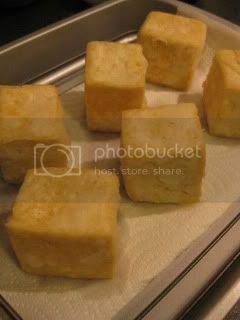 Deep-fry the tofu cubes until light golden (about 3-4 minutes). 8. Plate the tofu cubes and pour the broth over them. Garnish with the grated daikon and shichimi pepper (optional). Making the recutangular homemade tofu has become my regular weekend activity lately. These are basically all you need to make the authentic and healthy tofu: Natural soy milk (with no additives. 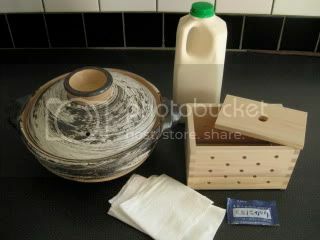 I buy from Meiji Tofu), nigari liquid, water, Classic-style "all purpose" Donabe, wood mold, and cotton cloth to filter the tofu. *Soy milk must be the natural kind with no additives (i.e. it has to be made only from pure water and soy beans). **Nigari, which is the byproduct of the sea salt, is the extract of the sea water. In the traditional tofu making in Japan, only nigari is used as the coagulator of tofu, while most of the commercial kinds of tofu you find in the US use many additives. Nigari is considered to have many health benefits. Nigari liquid can be found at large Japanese grocery stores or some online specialty stores. I brought back a tofu mold set from Japan. 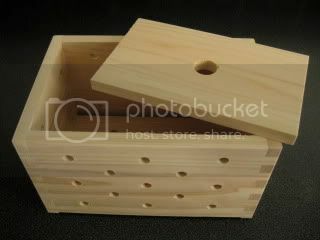 It's a beautiful wooden mold with a inner-lid (for the weight). The sides have the holes for the water to drain. 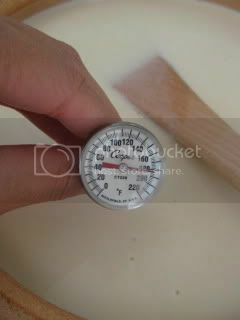 2 liters of soy sauce is heated in the donabe over medium-high heat. Stir constantly with a wooden spatula to prevent the skin to form on the surface, or the bottom from burning. 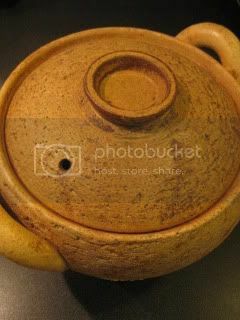 Combine the 2.5 to 3 teaspoon of nigari with 50 ml of boiling hot water. 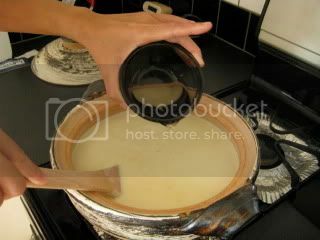 Once the temperature of the soy milk reaches 180-185 F (about 80-85 C) degrees, stir in the nigari-water mixture to the soy milk. Stir well. Turn off the heat. Cover the top with a piece of foil and close the lid. Let it stand for 20-25 minutes or until the soy milk is loosely formed to become tofu. 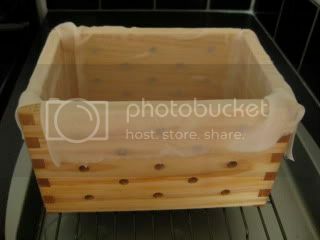 Meanwhile, soak the wooden mold in water for 15-20 minutes. Line the inside with the cotton cloth. Wet the cotton cloth. 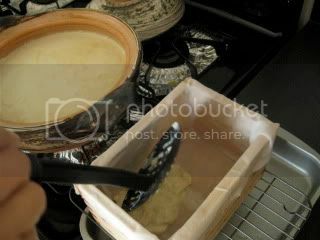 By using a slotted spoon, gently scoop the tofu into the mold over a drainer (a pan with the good depth and a rack) which is bigger than the mold. 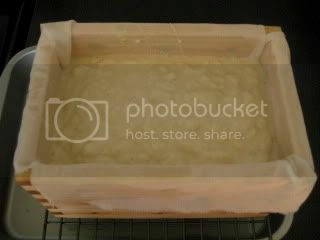 Gently fold in the top sides of the cotton cloth over the surface and place the inner lid. Put 2 food cans (about 2 pounds total) on the lid as the weights. 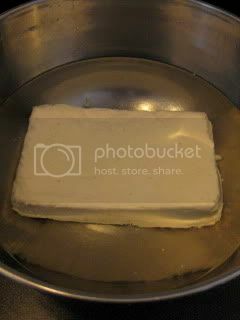 For the medium-firm tofu, let it rest with the weights for 20-25 minutes. Remove the weights. 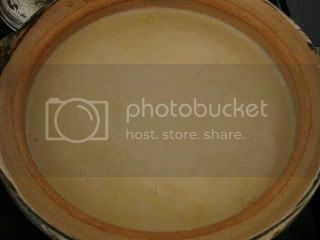 In a large bowl with the water, gently invert the mold (with the inner-lid) to unmold the tofu. 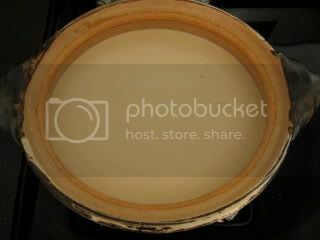 Remove the inner-lid and the cotton cloth. Let the tofu rest in the water for 30-60 minutes. Meanwhile, change the water 1-2 times in order to release the excess nigari flavor from the tofu. Now, tofu is ready to eat!! To best enjoy the freshly made tofu, I like the very simple preperation, such as hiya-yakko. In the top picture, I sprinkled the salt, scallion and grated ginger on top of the tofu and drizzeled a little amount of the sesame oil over it. Authentic homemade tofu is nothing like the generic factory-made kind you can find at a grocery store. It's like eating the soy garden!! !